Anyone can make a hard boiled egg but knowing how to cook a hard boiled egg that is perfect is a skill that is learned with time and practice. 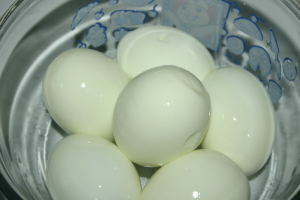 There are a few tips you will need to know to get a great hard boiled egg. The first thing to know is that to get an egg that will peel easily make sure that the eggs are several days old. If you have to use fresh eggs, you can make them peel more easily by steaming them for about twenty minutes. The eggs should be in a single layer in the pan. Cover them with cold water up to about an inch above the eggs. Adding salt to the water can help keep the eggs from cracking and will make them easier to peel. Bring the water to a boil and allow the eggs to boil for about a minute. After a minute of boiling remove the eggs from the heat and cover with a lid and allow them to sit for twelve minutes so that they will finish cooking. And for you crazy Easter-Eggers out there, remember that hard boiled eggs should be kept refrigerated and eaten within five days.